Here’s a healthy snack that will spoil you for taste and sustain you. 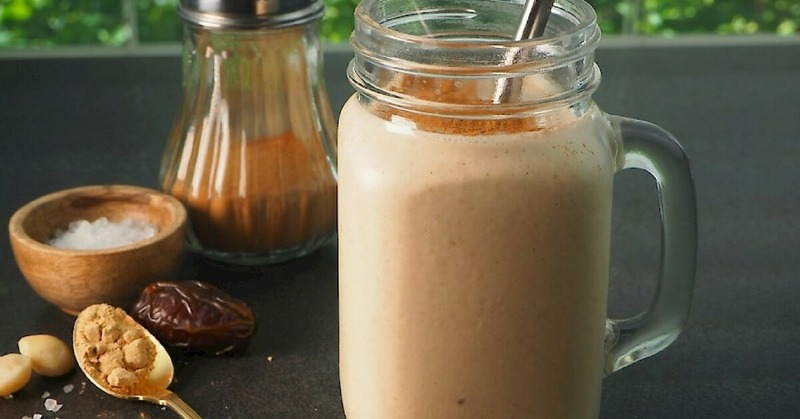 Macadamia nuts provide a creamy base to this smoothie, I’ve also used maca powder to add a malt/butterscotch flavour. Maca is packed with nutrients and known for increasing stamina and endurance. To make the macadamia nut milk: Drain the soaked nuts through a sieve and rinse well. Add the nuts and 100ml of the filtered water to a high-speed blender. Start on variable speed and incrase to high, blend for approximately 15 seconds. Scrape down the lid and sides of the blender jug. Add the remaining 100ml of water, dates, banana, maca powder, vanilla, cinnamon, salt and ice. Blend on high for 15 – 18 seconds or until you reach a smooth and creamy consistency. Pour into a glass or jar and sprinkle with a little cinnamon or maca powder.